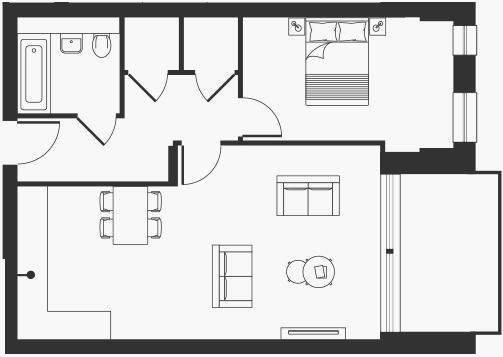 This second floor, one bedroom apartment will be excellently equipped for modern living, featuring sleek interior finishes and hi-tech appliances for a truly comfort-inducing environment. Residents will enjoy the spacious, open-plan design of the kitchen, living and dining area, which will allow both flexibility and integration, whilst a private balcony will be accessible, offering views of the development’s communal gardens. The bedroom will come complete with neutral-coloured carpeting and a floor-to-ceiling, fitted wardrobe, whilst the bathroom will showcase a sophisticated aesthetic with porcelain tiled floors and walls, a stone worktop and chrome-plated finishes.